Recorded live from the Sonesta Hotel in Downtown Philadelphia… the awards reception for the 2016 Charrette Venture Group Architecture Business Plan Competition. We chat with all the finalists, learn about the history of the competition and I sit down for a live one-on-one interview with the winner. We will learn more about their firm, how it was founded and their plans for the future, transitioning from design/build to architect as developer. What is the history of the Architecture Business Plan Competition? 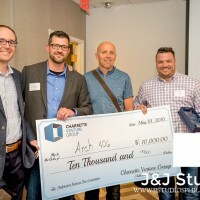 The Architecture Business Plan Competition is an annual event sponsored by Charrette Venture Group. Charrette Venture Group was founded by Matt Ostanik after Matt’s experience in both the architecture and technology worlds. He observed that many architects tend to struggle with successfully growing their business and he found through the tech industry that, in many areas, there’s an abundance of resources to grow your business. Not so in the architecture space. 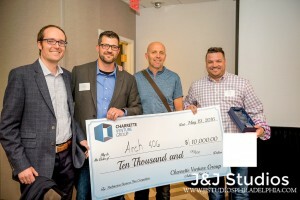 Charrette Venture Group’s goal is to provide resources and invest in architect entrepreneurs to help them grow their business. What’s the most important thing you learned while developing your plan for the Architecture Business Plan Competition? Brian M. Johnson with Arch.406, an architect-led design-build firm, found benefits from intentionally planning and thinking about how to get to the end result, sharing that that exercise alone has helped them significantly improve the quality of their business. They also found it incredibly beneficial to have something that forced them to lay out and communicate their firm’s priorities and understand the financials of the firm and where they want the costs and revenues to be. Clever Moderns is an an online platform for owner-builders to get online support, plans and empowerment to change their lives by building their own house. The most important thing Earl Parson learned through this competition was that even in moments lacking clarity, the world is so full of resources and information that you can find answers to whatever you’re looking for if you take the time and the effort to search for them. Courtney Brinegar, who created ADD+Venture as a nonprofit architect-as-developer practice, felt that the secret ingredient is the importance of a strong vision to drive everything forward. Lindsey Love & Lindsay Schack partner to create Love | Schack Architecture, which focuses on natural buildings and sustainable design. They found it vital to keep a tight timeline in order to work together to distill what exactly their firm is all about. Victor Caban-Diaz with Building Ingenuity learned that sometimes you can’t dive too deep into the details, but rather you should keep your focus on the bottom line. The name “Arch.406” comes from the area code of the state of Montana and the preface for the word “architecture” as an architect-led design-build. The firm came about because of Brian M. Johnson, Nick Pancheau, and Jeff Kanning’s observations at Collaborative Design Architects that architects get to work with the client for long periods of time designing the project, developing their intricacies and how they go about the process. Then, the relationship ends and clients are turned over to the general contractor. Instead of breaking that relationship, Arch.406 wants to control the project from start to finish and make valued decisions based on the best design. Brian M. Johnson’s greatest piece of advice is to not to let your anger or past hurt drive you in the wrong direction. Jeff Kanning reminds architects to be patient and give time to assimilate; listen, learn, and build a knowledge place to get to where you can really be successful. Nick Pancheau wants architects to embrace the specifics of your plans and how you’re approaching the practice of architecture. Connect with Arch.406 online, on Facebook, and search #arch406 on Instagram!